(*) A note about the player counters: to aid players with color-blindness, these counters all have symbols on one side. Players may decide whether to play with these symbols face up or down in order to keep track of which counters belong to the different players. 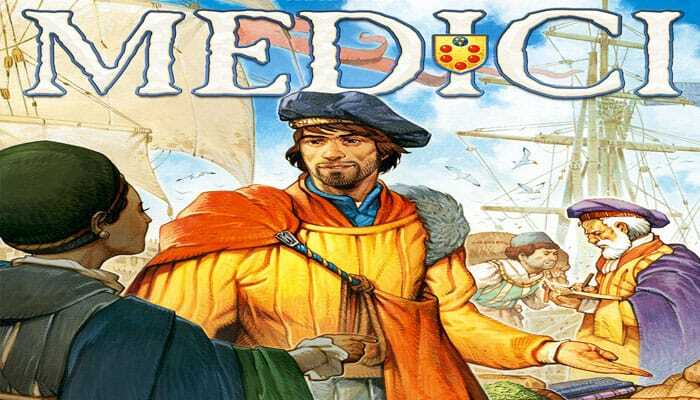 Medici is an auction game that takes place over three days (rounds). Players take turns presenting goods to be auctioned. Successful bidders will then load these goods o to the decks of their ships. Once all ships are full, or the deck of commodity cards is depleted, each day ends. Players then receive florins (money) for the value of the loads in their ships, and for how much of each commodity they have bought thus far. But be careful - the money you use to bid at auctions is also your end game points! After three days and three scorings, the player with the most florins will win the game. Use the image on the left as a guide to help you set up the game. Each player chooses a color and takes the corresponding ship mat C and six wooden counters in that color. In a two player game, players also take the smaller ship mats D, placing them alongside the longer ones, thereby extending them. Place the board A in the middle of the table. On the board are five market tracks in the shape of triangles, one for each of the five commodities (cloth, fur, grain, dye, and spice). 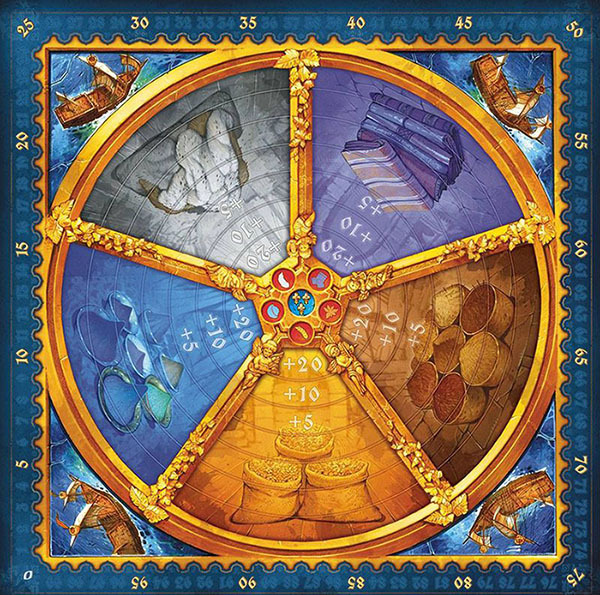 To begin the game, all players must place one of their colored counters on the bottom (8th) level of each of the five tracks, on the gold frame E.
As the players buy merchandise throughout the game, they will move their counters upwards to track their purchases of each commodity. There is no limit on how many counters can sit on each level of these tracks. 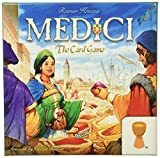 At the center of the board is a version of the famous Medici family crest. Place one of each of the five commodity scoring markers on each of the five red "balls" of the crest F. Then place the two blue day markers on top of the blue symbol on the crest in a stack, so that the marker with one fleur de lis is on top G.
Around the outside edge of the board is the money track. This is used to record each player's florins throughout the game. The track is labeled 0 - 99. If players' money exceeds 100, simply continue moving beyond the 99 mark, with counters flipped over as a reminder that their total money is + 100 of the value of the spot their counter is sitting on. The 36 cards represent the five commodities being bought and sold in the game. Each commodity has cards with the values: 0, 1, 2, 3, 4, 5, 5. Shuffle all the cards and remove the number specified, setting them aside unseen. The cards in use form a face-down draw pile B. The players randomly choose a starting player for the first day. This player places the start player token I in front of them. Play always proceeds clockwise. Players will take turns selecting cards that will make up groups of commodities to be auctioned. On their turn, players must draw the top card from the draw pile and place it face up so all the players can see it. After examining the first card, the player may draw a second and a third in like manner, placing any drawn cards next to the previous. The player may stop drawing cards after one or two, but cannot draw more than three. Once the player has flipped a card, it becomes part of the group to be auctioned. When a player completes a group (1, 2 or 3 cards), it is auctioned. The cards are sold as a group and may not be split. The bidding starts with the person to the left of the player who selected the group. Each player, in clockwise order, gets just one opportunity to bid on each group; choosing either to place a bid or pass. Any successive bids must exceed the previous highest bid for the group. The player who selected the group will always be the last player to bid or pass. The player with the highest bid takes the group of cards that was auctioned and places them face up on their ship mat in the spaces provided. The player then pays their successful bid price by moving their counter down the money track the same number of spaces as their bid. As a player's money may not fall below zero, a player may not bid more money than they have (players can never borrow money). 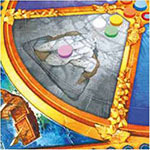 It is now the next player's turn (the player to the left of the previous player). This player takes the start player token and then selects a new group (of 1, 2 or3 cards) which is then auctioned. When a group is bought, it is loaded in its entirety onto the player's ship mat; it cannot be returned, traded, split or discarded. Players cannot buy more cards than their ships can hold: each player's ship mat has only five spaces that hold one card each (seven spaces in a two player game). 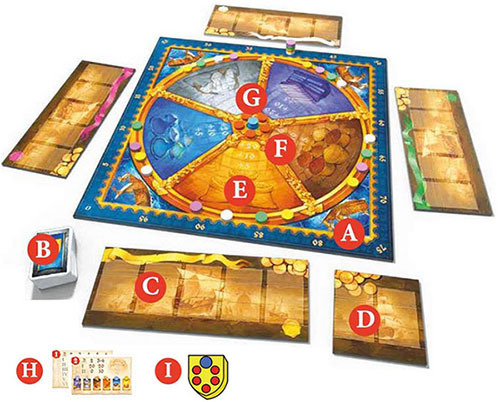 Players cannot bid on a group that would cause them to exceed the five space limit on their ship (seven space limit in a two player game) - they must pass in such a situation. On a player's turn they may select a group for others to bid on that contains more cards than they, themselves can buy. However, a player cannot present a group for auction larger than at least one player can bid for. When a player's ship is full, that player is out of the game for the rest of the day and can no longer select or buying groups. A player cannot win an auction with a bid of "zero". At least 1 florin must be bid. If no one wishes to or is able to bid on a group (everyone passes), the cards of the group are discarded unwanted and placed with any cards removed from play at the beginning of the day. Adam has two commodity cards on his ship and it is his turn. He selects a group of three cards to auction. Kylie already has three cards on her ship and Jason has four; both must pass. Diane has two cards and bids 7 florins for the group. Adam bids 8. Adam is last to bid so he has won the auction. He puts the cards on his ship mat and pays 8 florins by moving his money counter back 8 spaces on the money track. If someone were to select another group of three cards, Diane, the only player now with room for three, could buy the group for one florin as all other players would have to pass. When all the players but one have filled their ships, the last player takes enough cards from the top of the draw deck to fill their ship. These cards cost nothing, but must be taken as they come - there are no choices. If there are not enough cards to fill the ship, it sails with empty holds. The day then ends and is scored. A day can also end when the deck of cards runs out. When this happens, one or more of the ships will sail with empty holds. This occurs when too many cards are discarded during the day (with no one bidding on them). Note: Players may count the cards remaining in the deck, but may never look at them before they are drawn to be auctioned. Use the player aid cards as a reminder of how to score each day. At the end of each day, players earn money for the cards they have bought. First, all players total the values of their cards on their ships by adding the numbers on the cards. The player with the most valuable ship receives the highest payment. The player with the lowest value ship gets nothing. The following table shows the amount each player receives - note that payments are dependent on the number of players. The players' counters are advanced along the money track by the amount of their payments. If two or more players tie, the corresponding payments for their placings are added together and divided among the tied players (always rounded down). Adam fills his ship with a total value of 23 (Cloth 5, Dye 5, Grain 3, Grain 0, and Gold 10). Kylie fills hers with 20 (Grain 5, Dye 4, Fur 4, Fur 3 and Spice 4). Jason fills his with 16 (Cloth 3, Spice 5, Cloth 2, Cloth 1, and Dye 5). Diane fills hers with 16 (Spice 3, Grain 5, Grain 4, Grain 2, and Fur 2); and Kevin fills his with 14 (Spice 5, Spice 2, Dye 3, Dye 0, and Cloth 4). The next step is to count the number of purchases each player has made in the five commodities (cloth, fur, grain, dye, and spice). The commodities are scored one at a time. Each player moves their counter up on every triangular track by the number of cards of that type currently on their ship. The counters cannot move beyond the highest level. The value of the cards is not considered, just the number of cards. Note: The Gold 10 is not counted because of its rarity. After moving the counters, the player who is in the highest position on each commodity track is awarded 10 florins. The player in the second highest position on each track receives 5 florins (except in a two player game where the player in the second position receives 0). In the case of ties, the awards are added together and then divided among the players involved (always rounded down). Players who have not purchased any of a commodity can still be awarded florins if they tie for first or second at the lowest level of each track (the gold frame). Here, the yellow player receives 10 florins, while the pink, white and green players - all tied for second place - receive 1 florin each (5 florins, divided by 3 and rounded down). Additionally, a player who reaches the top three levels of a commodity track receives a bonus of 5,10 or 20 florins (as noted on the board). If two or more players are in the same bonus level, each receives the full bonus; it is not divided. When all five commodities have been scored and the players have been paid by advancing their counters on the money track, the next day begins. Note: The counters on the commodity tracks do not reset and should remain in place for the next day. Here, the yellow player receives 30 florins (10 plus the bonus of 20). While the white and green players - tied for second place - receive 12 florins each (5 florins, divided by 2 and rounded down, plus the bonus of 10) and pink receives nothing. To help players keep track of which commodities have been scored, the red commodity scoring counters should be flipped over as scoring occurs. To track the rounds, remove the top counter on the day counter stack at the end of day one. 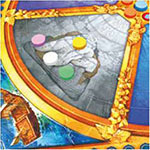 After day two, the second counter can be removed, showing the symbol with three fleur de Lis (printed on the board), representing the third and final day of the game. At the start of days two and three, gather all 36 cards together again. Shuffle them, and then remove the stated number of cards on page 4, creating a new draw deck for the new day. The player with the least florins will become the new start player. In the case of a tie, randomly select one of the tied players to begin. After the third day has been scored, the game ends. The player with the most money wins. In the case of a tie, the players will share the victory! You need not always possess the most valuable ship to win the game. Filling a medium value ship at low cost can be more profitable than bidding high for high-value cards. Also, by buying cards in just one or two commodities, you can earn a lot of money with bonuses over three days. After drawing the first card on your turn, always consider the value of the current group to you and to the other players. The higher the value to you and the lower the value to the others, the better. Keep drawing if you expect to improve your situation. Bidding last gives you control over the auction. As a beginner, you should not bid too high - bid high only for high valued groups with commodities which will bring you bonuses. Naturally, all this changes if several lots have been discarded and the cards are short in supply. Ending up with empty holds is usually a disaster, as it leaves you with a low-value ship and lower positions on the triangular tracks.